(3:05 p.m. EDT) -- Crown Princess departed Southampton today at 3 p.m. local time and is headed for Lisbon where it is expected to arrive on Wednesday. The ship will overnight through Thursday afternoon, after which it will sail directly to Bermuda. In addition to missing Le Havre, Crown Princess was forced to skip calling in Vigo and will miss a port call to Ponta Delgada. "Any decision on compensation will finalized when the impact of this severe weather on the itinerary is fully known," a Princess spokeswoman said. (October 26, 2013, 2:06 p.m. EDT) -- Princess Cruises is keeping Crown Princess in the port of Southampton due to strong winds and high swells. The ship may stay in port one or more nights as needed, the line said. Two storm systems, the first which hit today, bring with them sustained winds of 40 to 50 miles per hour and wind gusts of up to 60 miles per hour. 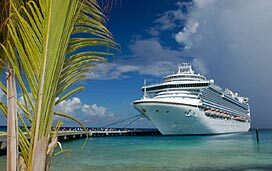 "Due to the weather causing heavy wind and swell conditions, Crown Princess will remain in Southampton until the system passes," a Princess spokeswoman told Cruise Critic. "We anticipate the ship will depart Monday night." Though a new itinerary has not yet been determined, the ship will be forced to skip its scheduled call on Le Havre (Paris) tomorrow.